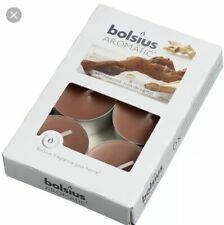 Bolsius 6 pcs Scented Candles Sandalwood Brown 103626150323. Lighting a scented candle is an easy way to create a relaxing ambience or combat the unwanted odours of pets or cigarette smoke by filling the room with a pleasant fragrance. Bolsius Aromatic Tea Lights 72 pcs Sandalwood 103626949323. 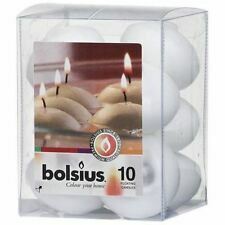 With these Bolsius aromatic tea lights, you can create a refreshing ambience in your room quickly and easily. These tea lights release the scent of sandalwood. 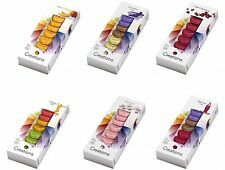 Box of 6 Bolsius Aromatic Scented fragranced Tea light candles 🕯. 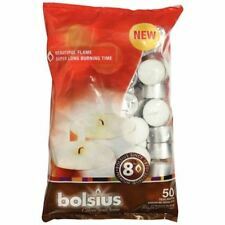 Box of 6 Bolsius Aromatic Scented tealights. Condition is New. These set of tealights allows you to create an atmosphere and ambience quickly and easily and are perfect for smaller rooms. "BULK BUY" Bolsius Sandlewood Scented Tea Light Candle. Pack of 6. x 4. (24). Discover the scented candle in glass Sandalwood of Bolsius Aromatic. Colour and scent invading everything, spreading a pleasant fragrance that retains its character and intensity. Scented candles in glass are the ideal size for small rooms, but they can also be used in combination with other scented candles or other scented products to create a fragrance. SANDALWOOD SCENTED TEALIGHTS 6. Fragrance: sandalwood. Scented tealight features Perfect for inebriate the House of your favorite fragrance. -UNIQUE CODE. USERS ARE REMINDED THAT REQUIRE ELECTRONIC INVOICE, ATTACH THE FOLLOWING INFORMATION. 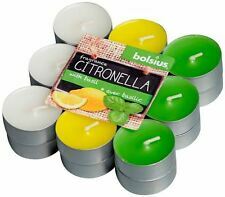 Isandalwood scented tealights to Bolsius Aromatic allow you to create an atmosphere in every room quickly and easily. SANDALWOOD SCENTED TEALIGHTS 18. Scented tealights features Fragrance: sandalwood. You can match it to other candles of different colors and size. The Bolsius uses high quality raw materials that allow the candle to burn longer and better. VOTIVE CANDLE ROUND < span class = notranslate ' > 5.3 CM SANDALWOOD.